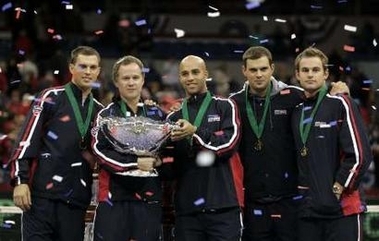 I was there for tennis history when the U.S. defeated Russia to win its first Davis Cup since 1995. Check here to see news, notes and commentary from Portland, Oregon. For continued coverage, including articles and updates on the U.S. vs France Davis Cup match in Winston-Salem in April 2008, go to www.topspinblog.com. There were no epic matches in Portland, but the 107-year-old silver hardware will be in the states for at least a year. The U.S. posted wins this season over the Czech Republic, Spain, Sweden and Russia. Above the team poses with the cup Sunday afternoon, one night after the sure-to-be legendary team party. The Bryan brothers' blog Sunday night confirmed that Andy planned to "tie" one one and bail out on Sunday's match. Bob Bryan wrote, "It was about 6 o'clock last night when Andy told me that he wouldn't be ready to play today - he'd had a few too many at the victory celebrations." The champs have only two months to enjoy the victory until the first round of the 2008 draw begins. The U.S. team will travel to Vienna, Austria to play indoors on slow, red clay Feb. 8-10. Imagine in the World Series after the winning team sweeps the series in game four and celebrates on the field and in the clubhouse, they returned to play games five, six and seven just for the hell of it. That’s essentially what the Davis Cup does. Although the U.S. won the tie yesterday by winning the first three duels, two more meaningless singles matches will be played today. The USTA sold only three-day passes, so they have obligations to meet. The biggest event will be the U.S. team posing with the trophy, a colossal piece of hardware that must run up one hell of a shipping bill. Bob and Mike Bryan, the all-American doubles duplicates, buckled down Saturday and overcame a 1-3 deficit in the first set tiebreaker, winning the first set and never looking back until red, blue and silver banners streamed from the roof of the Portland Memorial Coliseum and the engraver began scratching American names onto the trophy. "We've been working for this since we were two-years-old," said Bob, or maybe it was Mike. "All I can say is whew!" 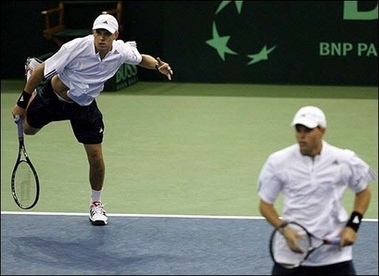 The Bryans dominated the Russian pair of Davydenko and Andreev, singles stars whose strategy consisted of staying on the baseline and whaling at groundstrokes, a plan that was doomed on a hard fast court. The Bryans win that clinches the first Davis Cup for the U.S. since 1995 will be a career cornerstone for the number one doubles team in the world that is now 13-1 in Davis Cup play. Considering the anonymity in which doubles teams toil, it was a great moment to see the Bryans, who turn 30 next April, clinch the victory. And finally, the Bryans won the match, and the streamers fell down and the players hugged and then mugged for pictures, signed autographs, and a good time was had by all. 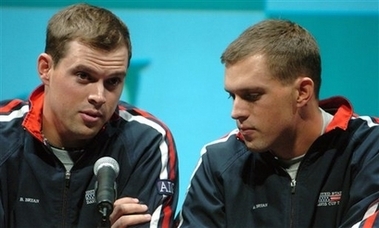 Identical twin brothers Bob and Mike Bryan can bring home the silver reward that is the Davis Cup with a win today, ending a 12-year-trophyless streak for the U.S. team. The only way to tell the 29-year-old brothers apart is that Bob is a lefty and Mike is a righty. Twenty percent of identical twins have such different hand preferences. The day in the Portland Memorial Coliseum started with a warm-up performer banging on plastic buckets--fresh from the Tyra Banks Show, a breathless announcer proclaimed--moved on to Andy Roddick banging aces (25 in 14 service games), and essentially ended with Mikail Youzhny's deleterious decision to hit a drop shot that ended up in the bottom of the net in the fourth-set tiebreaker that he was losing 4-3. All of Russia must have winced when Youhzny went for a drop shot from his backhand side. Youzhny had hit numerous stunning one-handed backhand winners in the hard-fought match, but very few dropshots, so his decision to do so at a critical point in the tiebreaker was ill-advised. Even if the spinning softy had cleared the net, fleet-footed James Blake would have run it down. Blake played two strong points after that and closed out the match, putting the U.S. up by two points in a three point contest. I guess James figured it was someone else's time to choke. And that gets me to Youzhny's drop shot attempt, after which point we all waited in a long line of traffic to escape the concrete parking deck. Check out the Davis Cup slide show on Yahoo if you need images to go with these words. In no other sporting event is the home court advantage more significant, primarily because the hosts choose the surface. U.S. Captain Patrick McEnroe chose a Baltimore company to construct a portable cushioned-hard court to his players' liking, The Miami Herald reports. Last year, the Russians beat the U.S. on red clay in Moscow, but today they'll toe the lines on a Maryland-made fast court that was shipped in last week. Viewers today should also plan on watching that digitized image of the ball flying down and hitting (or missing) the lines again and again. Unlike Grand Slams where players have two challenges per set, this weekend will have unlimited challenges -- why not get a second opinion if the call doesn't goes your way? McEnroe is against it but could not sway the International Tennis Federation who calls the shots. Joe Samuel “Sam” Starnes was born in Alabama, grew up in Cedartown, Georgia, and has lived in either New Jersey or Philadelphia since 2000. Red Dirt: A Tennis Novel is his third novel. His first novel, Calling, was published in 2005, and was reissued in 2014 as an e-book by Mysterious Press.com/Open Road. NewSouth Books published his novel Fall Line in November 2011, and it was selected to The Atlanta Journal-Constitution’s “Best of the South” list. He has had journalism appear in The New York Times, The Washington Post, The Philadelphia Inquirer, and various magazines, as well as essays, short stories, and poems in literary journals. He holds a bachelor’s degree in journalism from the University of Georgia, an MA in English from Rutgers University in Newark, and an MFA in Creative Nonfiction from Goucher College. He was awarded a fellowship to the 2006 Sewanee Writers’ Conference. He works in the administration at Widener University and has taught writing courses at Widener, Rowan University, and Saint Joseph’s University.